THIS CABIN MUST BE RENTED A MINIMUM OF 30 NIGHTS DUE TO H.O.A. 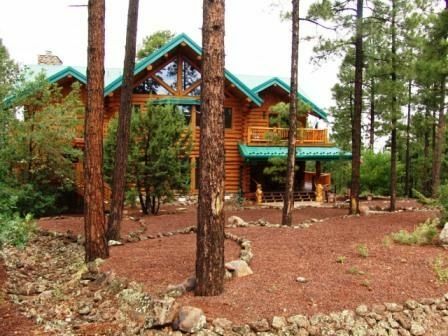 White Mountain 3,854 sf custom log home in a gated community on ridge with spectacular view. Large decks include comfortable furniture and fountain for added outdoor living providing a lovely place for appetizers and cocktails at sunset or a leisurely morning breakfast. Gourmet kitchen with high end appliances by Wolf and others awaits. Two full master bedroom suites include large closets and full baths, decks and views. The queen and twin bedrooms share a bath and include a private deck for the queen and shared deck for the twin bedroom. Amenities include the ultimate El Rancho Merlita shampoo, soap and lotion to get you started. Conveniently located for all Sportsman activities. Just 30 minutes from Sunrise Ski Resort, and less to great fishing and a multitude of other outdoor activities. Words cannot describe the beauty and the grandeur of this special creation inspired by old European fairy tales. Designed and hand crafted from beginning to end in 2000 by the woman owner/architect, you will never find another place like this. I am an architect and general contractor with a background in forestry and working at national parks in my younger years. The Inns at El RANCHO MERLITA in Tucson, Arizona are one of my many projects. My favorite activities are hiking, skiing, hunting, cooking, designing, building, and playing with my family and grandchildren. We are 5th generation natives from Arizona and love the White Mountains. My husband's family ranched in the rim country in the early 1900s. We've had a place in the Pinetop area through many generations. Our location overlooks the reservation to the south keeping us close to wilderness area. At 7,000 feet in elevation, it is a great place to be year round. Winter skiing in 1/2 hour away, fishing even closer, and summers are heavenly. Sauna Steam Shower in Lower Master Bathroom. Real log home. Gorgeous. Exceeded our expectations. Fabulous home, perfect location, all of the amenities and more. Already planning for a return trip next year. This place has it all! The attention to details that went into the architecture of this beautiful cabin is superb. There's even a dumbwaiter that covers all of the levels, from the garage floor to the very top. You'll enjoy the 4 fireplaces, the open space, the wrap around decks and the close proximity to everything. I definitely intend to rent this beauty again! Remarkable architecture, gorgeous setting, the luxuries of a fine hotel (immaculate) combined with the comforts of home. Great place for a group gathering. Easy to find. Very quiet neighborhood. All contact with owners was prompt and professional. Once you have filled the fridge (cupboards are stocked with many staples, cook and service ware are plentiful) ) you won't want to leave! If you do, enjoy a fine meal at Bocado. Hit Happy Hour at Charlie Clark's. Walk the Rim Trail. But mostly enjoy the peaceful beauty and comfort of this special home! Our family rented this home to spend time during the holiday and we were all blown away with how beautiful this home is. The description of the cabin was accurate and we had everything we needed to make our stay comfortable. We found the property to be clean and well maintained, and the owners were available by phone if there were any issues. The bedrooms are roomy and cozy, and the living area was very spacious. The kitchen was fully stocked with everything we needed to help cook some wonderful meals. I especially liked the food warmer, which helped to keep our food warm while we cooked the rest of the the meal. The dining room and table was large enough to have all of us enjoy our meals together. We enjoyed playing pool in the upper floor while listening to good music. The bathrooms are roomy and the tub was perfect to bathe our twin grandsons in. The back deck is large, we enjoyed our morning coffee while enjoying the view of the pinetrees and listening to the birds singing. Everything we needed was close by, Safeway and Walmart, to purchase what we needed. We did not eat out, although there were many restarurants close by. The home is beautifully decorated which brings added charm to it. There is also a great selection of books to read, and many board games and puzzles to play with. I would certainly recommend this property to friends, we loved staying here, and hope to return again someday. Our stay at the cabin was fantastic overall. We had ample space for our extended family (12), ages 8-60+. We felt very much at home there, especially as it was decorated for the holidays! We enjoyed cooking some wonderful meals, with everything you could wish for in a kitchen. All drawers were labeled, so it was easy to locate any needed item. There were a couple of minor things - needed snow removal from the driveway, and firewood supply was low. Since we arrived on a Friday afternoon, there was no one at the office number and I did not have Valerie's cell phone with me. It would be helpful if that was added to the reference sheet in the cabin. Those things were minor, and we enjoyed the house tremendously. It is always wonderful to share the cabin with those who appreciate its warmth and beauty. We have handcrafted this home to welcome our family and guests as an authentic log cabin forest get-away. We strive to provide everything a person or group of people would need for their stay. During the winter it is difficult to predict the snow situation, but thankfully we have a snow plow crew who is on call to clear our driveway upon the request of us, the owners, or the guests if they call. Thank you for staying with us! Peaceful Paradise! This cabin is perfect. Amazing sunset views from the cabin's back deck. The interior is wonderfully decorated and cozy. Very spacious with many beds and a large dining area. Living room has many seating places. There's a pool table on the upper floor. If you are a reader you will be in paradise iwth all the books in this cabin. The bathrooms are great and the whole place is squeeky clean! Highly recommend.